PC Time Management That Works! Use the computer dashboard to quickly see the top users on the computer and their daily usage for the last 7 days. Color coded meters give at-a-glance views of usage relative to computer time limits you have set. One click to set computer time limits, limit computer time based on a schedule, identify problem apps, set actions for exceeding time limits and set up alerts to let you know real-time how your efforts to limit computer time are working. Add additional users and computers so you can limit any computer time and limit any app time in your home, all from your computer. Limit computer time for work days and non-work days. Limit computer time per session, limit computer time per day and limit computer time per week. Time limit tools are simple and intuitive, using the same interface for computer time limits and app time limits. Set computer and app break times for work days and non-work days. Enforce breaks when computer and app time limits have been exceeded. Set permission to earn and use reserve time to extend computer and app time limits. Award reserve time for staying within limits and for taking required breaks from the computer or any app. Set the days of the week and the hours of the day when computer or app usage should be blocked. You can set schedules with 15-minute granularity. Set the days of the week that are work days vs non-work (play) days. Limit computer time and app time differently for work days and non-work days. Take advantage of flexible and productivity enhancing options to enforce computer and app time limits. Your choice to log the user off, lock their workstation (without losing work in progress) or close any app that has exceeded its time limit. Choose to block computer access when a break is due or during certain times of the day while allowing the computer and productive apps to be used at other times, all according to established time limits. 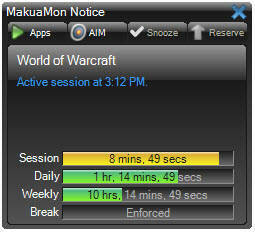 Turn on AIM and MakuaMon will escalate exceeded limit consequences when computer time limit objectives are not being met.